The Lowdown: Unlike the superficially similar Very Bad Things, this comedy doesn’t go for the jugular—it’s intermittently funny, but isn’t destined for cult classic status. Scarlett Johansson leads a group of women behaving badly in Rough Night, an uneven but passable comedy that recalls Peter Berg’s directorial debut Very Bad Things (1998). The premise is similar: a group of partiers accidentally kills the stripper they hired for a private gathering. Superficially, Rough Night presents a gender switch—a bachelorette party as opposed to the bachelors of Very Bad Things. Women can be as wild men, sure. But on a deeper level, Berg’s pitch-black film manages to be funny while living up to its title. Rough Night, director Lucia Aniello’s leap from TV (Comedy Central’s Broad City) to the big screen, doesn’t stick to one’s consciousness the way Berg’s does. That’s okay, Aniello (who also co-produced and co-scripted) is clearly after easier, lighter laughs than Berg (a director of remarkable diversity who helmed my favorite movie of 2016, Patriot’s Day). The female-dominated ensemble is spirited and goes a long way towards helping the film’s 101 minutes glide by smoothly. Unfortunately, again unlike the nearly 20-year-old Very Bad Things, Rough Night probably won’t linger in any given viewer’s mind for much longer than the time it takes to walk from the theater to their car. 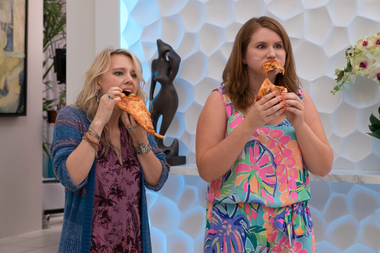 The movie traffics in the sort of bawdy humor recently seen in The Night Before and Office Christmas Party (both of which share Rough Night cast member Jillian Bell, playing essentially the same character in all three). No need for a laundry list of attempts—some of this stuff is chuckle-worthy, some of it evokes Weekend at Bernies more than anything else. Demi Moore and Ty Burrell are underused as horny swingers residing in an adjoining home, but they do provide an amusing distracting when the gals try to dump the stripper’s body in the ocean. Be sure to stay through closing credits. Kate McKinnon, playing Jess’ Aussie friend Pippa, performs an original song (which summarizes their ‘rough night’). And at the very end, post-credits, there’s a scene that resolves what seemed to be a loose plot end. Bottom line: go into Rough Night with highly tempered expectations and enjoy it for the lark it is.